Visions of Jesus Christ.com - The Bleeding Candle - Our Lady of Guadalupe's powerful intercession. Above image/story from [guadaluphouse] flickr. Photo taken on January 5, 2002. This photo shows a standard 10-inch votive candle that was brought to a meeting by a lady-friend - "Julie" - who was suffering from severe headaches caused by an inoperable brain growth. She had been attending our meetings regularly to pray for a cure and noticed a steady decrease in her pain as each week passed. She offered the lit candle to Our Lady of Guadalupe as a way of thanking her and placed it near the outdoor shrine during one of our meetings. Remarkably, the candle remained lit for an entire week despite frequent rains and windy weather . While other candles that were lit in the garden on the same night had long blown out, Julie's candle continued to resist the weather; it was clear that something unusual was taking place. 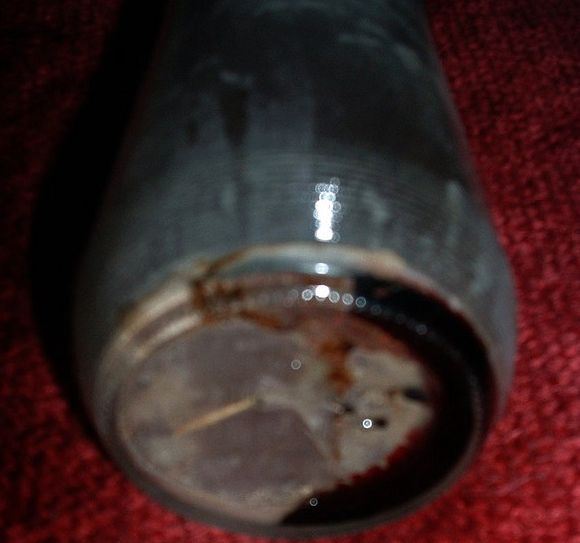 At the end of the next prayer meeting, Julie's candle went out on its own and it was discovered that a red, blood-like fluid had appeared at the bottom of the glass bottle [see photo] although the candle had been made of white wax. Julie later testified at our next prayer meeting that her doctor had informed her of the unexplainable disappearance of the growth in her brain! I was asked to keep the candle and to share it as a testimony of Our Lady of Guadalupe's powerful intercession and her loving compassion towards those who seek her help. The fluid is dried now and has never been officially tested for blood... for us the miracle lies not in the candle itself but in Julie's healing. Today, she continues to be a grateful and devoted child of Our Lady of Guadalupe. [See/view] story titled the Grace of Escarchas from St. Anthony - Oahu, Hawaii. Visit guadaluphouse's [blog].